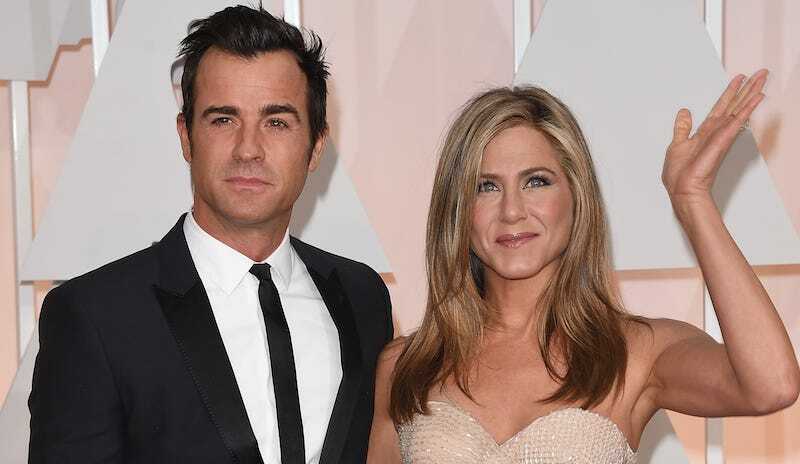 Jennifer Aniston Maybe Just Got Secretly Married, So, Cool? Jennifer Aniston, patron saint of the sad and lonely women who didn’t realize they were sad and lonely because they’re just living their lives and not focused on society’s archaic notions of what a woman needs to be happy, probably got married yesterday. TMZ obtained photos of a large celebration taking place at Jennifer Aniston and Justin Theroux’s home in Bel Air and yeah, all clues point to a big ‘ol wedding. Our sources say Jen told friends she was throwing a surprise 44th bday bash for Justin. Friends like Howard Stern, Chelsea Handler, Sia, Lisa Kudrow and John Krasinski showed up — but the cake we spotted going into the house Wednesday afternoon looked awful wedding-ish. It had TWO muppet-like characters — male and female — on the top. If it was just a birthday party for Justin ... why have 2 people on the cake? Second major clue — an actual man of the cloth! A pastor WITH bible in hand was walking into the house. Who blesses a birthday party? Ok, girl. I mean, good for Jennifer and Justin but also, whatever? They certainly didn’t seem to be particularly stressed out over tying the proverbial knot so I know good and well that I’m not going to be super bothered either way. Congratulations, to the happy couple, maybe! And if Jennifer Aniston was just celebrating her 44th birthday with her closest friends and family and the man she loves, then an equally hearty congratulations on that as well.